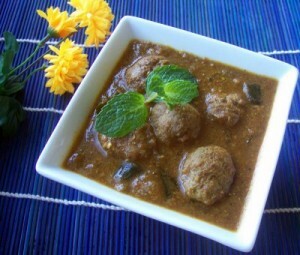 Lagan Ke Koftay recipe by Nazia Nazar at DesiRecipes.com. Lagan ke Koftay is a very popoular dish. Minced meat formed into balls, cooked in rich and aromatic Yogurt gravy. Mix the salt and papaya into the minced meat and set aside. Grind together all the ingredients listed from ginger / garlic upto the coriander and mint leaves, mix this well with the minced meat. Take small portions of this mixture and shape into koftas or round meatballs. Spread them on a greased Lagan or a shallow pan with a lid and cook over a low heat. When the water dries, gradually add the oil. In another pan fry the onions till they are light brown. Add the yoghurt to the onions and cook till the water of the yoghurt evaporates. Pour this over the koftas or meatballs. Remove from heat. Put the piece of coal directly on a flame. When it becomes red put it on a small piece of roti or bread or a small receptacle made of aluminium foil. Place this in the pan containing the koftas. Pour 1 teaspoon of oil on the piece of coal. Immediately cover the pan with a lid for 5 minutes. This gives the food a barbecue flavour. Its ready, serve hot with naan.